Fresh encroachment bid in Tinsukia’s Lakhipathar reserve forest! 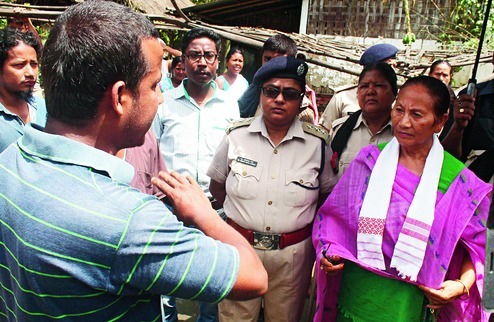 A day before Assam Forest Minister Pramila Rani Brahma holding a discussion over rehabilitation of the forest villagers from Mising community living within Dibru-Saikhowa National Park, hundreds of aggrieved villagers hailing from Laika Forest Village in Tinsukia and Dadhia Village in Dibrugarh allegedly moved towards Mamorani area in Digboi Division and attempted to encroach areas near Lakhipathar reserve forest in Tinsukia on Saturday late night. According to sources, the encroachers with bag and baggage entered the said area with an intention to settle there after the failure of Chief Minister Sarbananda Sonowal-led government in Assam to rehabilitate the people despite several prayers, petitions and memorandums to this effect. However, the local villagers of Siring Mamaorani under Digboi Police Station resisted the encroachers and drove them back thus protecting the area from further encroachment. As per the directives of Chief Minister Sonowal after meeting the representatives of the Mising community who apprised the CM of the plights of the villagers from the two forest villages recently, Forest Minister Brahma along with a host of top forest officials held talks at the Circuit House in Tinsukia on Sunday morning to discuss the status of the preparedness for rehabilitation of the villagers. The forest officials included the Principal Chief Conservator of Forest, Upper Assam, the Conservator of Forest, Eastern Assam Circle, the MLAs of Chabua and Tinsukia, the DFOs of Digboi, Dibrugarh, Doomdoma and Tinsukia Wildlife Divisions. Subsequently, the Forest Minister also held separate talks with the affected and ejected villagers gathered at Borguri Mising Gaon wherein sympathizing the cause of the villagers terming them ‘original inhabitants of Assam’ the Minister assured to speed up the process so that the affected people could be provided with land in various reserve forest areas in Tinsukia district by March 2018. According to Brahma, the Forest Department has geared up to conduct a survey and find out suitable forest reserve areas so that the process of shifting the villagers could be kick-started. However, lambasting the delay on the part of the Assam government and its failure to fulfil the stipulated deadline of 8 months committed on June 21, 2017 in a meeting held at Dadhia attended by the PCCF, Deputy Commissioner (DC), Tinsukia and others, a leader of the Mising students’ organization, Mintu Raj Morang alleged that the government has been repeatedly failing and changing dates after dates to come up with a concrete solution to the issue. It may be mentioned that Laika and Dadhia villages were established in the fifties within the Dibru-Saikhowa Reserve Forest under Dibrugarh and Doomdooma Forest Division respectively which later amalgamated in 1986 constituting a Wildlife Sanctuary vide Government Notification No. FRW.51/86/8 dt.26/09/1986 to be known as Dibru-Saikhowa Wildlife Sanctuary with an area of 340 sq km keeping both the villages inside the sanctuary itself. Further in 1999, by way of upgrading the existing Dibru-Saikhowa Wildlife Sanctuary as per the provisions of Wildlife Protection Act 1972, the entire area of 340sq km including the two villages were declared as Dibru-Saikhowa National Park subject to the condition of subsequent rehabilitation of the said two forest villagers vide Government of Assam notification No. FRW.21/90/171 Dt. 05/03/1999.